This is part of the “gear that I have owned” thread. 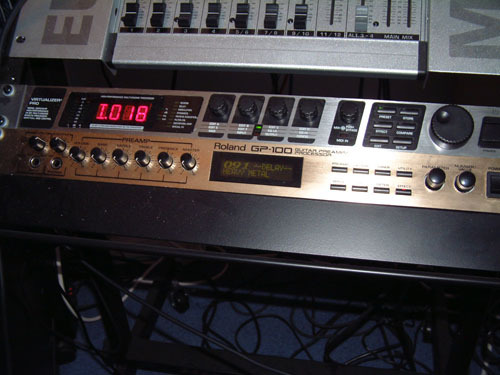 I bought a second-hand Roland GP-100 guitar effects processor from a seller on eBay back in 2003 in a whim. I didn’t really need it as I was using a Roland VG-8 guitar system, but I’d read in the past that Robert Fripp of King Crimson had used them and in a supreme case of “monkey-see, monkey-do” I bought this unit in an attempt to search for the “new sound”. The GP-100 is austentatious in its gold casing and fits in a 1U rack. In terms of sound, I was quite impressed by the COSM effects inside the unit considering it was quite an old piece of kit at that time and had been superseded by other effects units in the Roland range. I used it for parts of my Textures, Without Words and Empty Spaces albums. I tended to use the more unearthly effects that unit could produce and I must admit that I’ve found it hard to reproduce these sounds on my current rig. While I was impressed with the sounds, I wasn’t so impressed with the editing functionality. The unit came without instructions, so I had to bluff my way through using it and I found the editing side of the GP-100 rather user-unfriendly. But then I had been spoilt by the VG range of units from Roland and their slightly easier to use interface. I eventually sold the unit after a short period because it had developed a fault that meant it used to freeze up and stop working. The only way of fixing this fault would mean me taking a screwdriver to the unit, opening it up and removing/replacing the battery inside, which would somehow reset the unit back to normal. This took time, and was frankly a pain, so it had to go. If another one of these came up on eBay for the right price, I’d probably grab it just for the heck of it – though I am wary about the condition of these units now as they are rather old, they do go wrong and the front panel control are a little prone to wear.